Provide comfort for the family of Suzanne Reed with a meaningful gesture of sympathy. 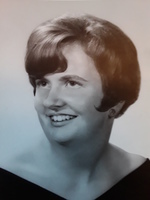 Suzanne Genthner Reed, 68, died February 20th after a brief illness at Eastern Maine Medical Center in Bangor. She was born May 15, 1950 in Rockland to Maynard D. Genthner and Louise (Erskine) Genthner. She attended Waldoboro schools, and was part of the last graduating class of Waldoboro High School. She graduated from Cosmetology School, and opened Genthner’s Coiffeurs. She was a hairdresser for many years. In June 1969, she married Gregory Pendleton, of Newcastle. They had a daughter, Cristal, and later divorced. In May 1983, she married Robert Reed of Wiscasset. They had a son, Matthew, and later divorced. She moved back to Waldoboro ten years ago where she resided until her death. Her favorite thing to do was spend time with her family and especially her grandchildren. Suzanne is survived by her daughter, Cristal Bryant ; grandchildren, Brandi Bryant (Jason Wellman), Drew Bryant, and Ernest Poland, and great grandchildren, Braelyn and Hunter Wellman. A son, Matthew Reed, and grandchildren, Caleb and Jasmine Reed, many close friends and her cat, Raffi. Friends are welcome to join the family for an informal gathering from 4 to 6 p.m. with a time of sharing at 5 p.m. on March 8th at the Hall Funeral Home, 949 Main Street, Waldoboro. Burial will be in the German Protestant Cemetery in Waldoboro in the spring. In lieu of flowers, contributions in Suzanne’s memory may be made to Midcoast Humane, Edgecomb Campus, 27 Atlantic Hwy., Edgecomb,ME 04556. Provide comfort for the family of Suzanne G. Reed by sending flowers.